03-Oct-2014 -- I first visited this confluence point almost 15 years ago, in December 1999. I decided to revisit it, in hopes of getting (1) better photos, (2) 'all zeros', (3) an aerial video from my remote-controlled quadcopter, and (4) a solution to one of the great mysteries of our time: How to pronounce "Bouse". As in my earlier visit, at the small town of Bouse I turned off the main road onto Swansea Road, which started out paved, but then turned into dirt (but smooth). (I have never visited the original "Swansea", in Wales, but I'm sure that the countryside there looks nothing like the harsh desert landscape here!) In 1999, I didn't have a 4WD vehicle, so I started hiking from Swansea Road, for a 1.1 mile each-way hike. This time, however, I took a very sandy 4WD dirt road that branches off the left of Swansea Road. This took me 0.7 miles from the confluence point - for a total of 0.8 miles less hiking than before. 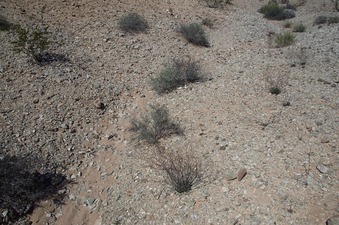 The area of the confluence point is a rocky/sandy desert, vegetated only by the occasional sagebrush (creosote?) and ocotillo, plus (in a few places) tiny thumb-sized cactus. It's clear that this is a very harsh environment, with little rainfall, and frequent high temperatures. (Even in October, it was around 90 F during my hike.) The confluence point itself lies in a small indentation. Nearby (though a few meters off) is a small rock pile left by previous visitors. After my visit, I stopped at the Bouse General Store to buy some snacks, and asked the clerk how to pronounce the name of the town. (This had been a mystery to me, to Joseph Kerski, and probably to other visitors as well.) She told me that "Bouse" rhymes with "House" (not with "Moose", nor with "Cows"). Finally, a mystery solved!